Credit scores are not only used by lenders to assess your creditworthiness but also by employers as part of their screening process. This practice is becoming more common and is particularly found when the position involves handling cash or confidential information. 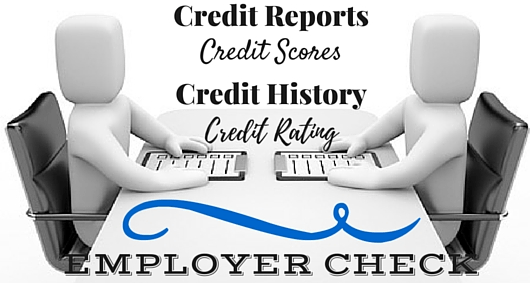 In certain industries, credit checks are a standard procedure. Your credit report can only be seen by your employer or the recruitment agency if you have given them, permission to do so. It is confidential and they have no right to view it without consent. Theoretically, according to the NCA, employers should only use this information to verify employment. In practice, this generally does not happen. It is important to keep an eye on your credit report and it is a good idea to take advantage of the free report you are entitled to every year. It is fast and easy to get your report and it can be done online in a few minutes. This way, you can check for any errors and see where you need to improve your credit. It is unlikely you will be turned down for a job for a few minor issues but a poor credit report could result in you not getting employment with that company. Take the time to find out so there are no surprises. A poor credit score could indicate to the potential employer that you will be under increased stress as a result of your finances. It can also make people more vulnerable to bribes or blackmail and can increase the likelihood of fraud and theft. Depending on the company and the position, a bad credit report can jeopardize your chances. You can refuse to give them permission to view your credit but this will make them think you have got something to hide and will raise their suspicion. It is better to have an honest approach and if there are any issues, you can explain the reasons for them and what is being done about it. You can only do this if you are aware of the details of your credit report. In a country like South Africa where such a large percentage of the population has credit-related issues, employment screening is a major issue. It should only be considered if there is a specific need and the reports should be viewed with an open mind.